Are all of your moffett operator’s certificates up to date? Fines recently issued for non–compliance are in excess of £1/2 million. MHA Training offer an extensive range of Moffett Training and all other types of Vehicle Mounted Lift truck training courses. We can tailor them to suit the needs of the individual or the business. On successful completion we can issue an RTITB Accredited moffett licence or an In-House moffett certificate. On Site Moffett Training only! 1 Day Moffett Refresher Courses. 2-3 Day Moffett Courses (Experienced Untrained). 3-5 Day Moffett Courses (Novice). 1-2 Day Moffett Conversion Courses. All Moffett training courses with MHA Training include Vehicle Mounted Lift truck training, certification and registration onto NORS. (National Operator Registration scheme). All of these moffett training courses are designed to meet the requirements placed upon employers with regard to their duties under the Health and Safety at Work Act. The Provision and Use of Work Equipment Regulations (PUWER), the Lifting Operations and Lifting Equipment Regulations (LOLER) and other relevant regulations and codes of practice. Moffett Certification / licence will be endorsed by the RTITB and can be tailored to suit your companies needs. In-House specific vehicle mounted lift truck training is also available. 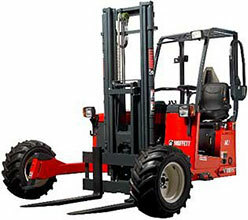 Novice - For a moffett operator with little or no experience of vehicle mounted lift truck operation. Experienced / Untrained - For a moffett operator who has not had formal training but has Vehicle mounted lift truck operating experience. Refresher - For a moffett operator holding a recognised certificate with approximately 3 years operational experience of Vehicle Mounted lift trucks. Conversion - For a moffett operator holding a recognised licence on one truck type looking to be trained on a vehicle mounted lift truck. If you are unsure as to what moffett training you require please fill in the form on our Contact Us page, call on (01925) 446718 (office) or 07862230077 (mobile). Alternatively you can email us at info@mhatraining.co.uk. We will be more than happy to assist or come and assess your current records free of charge to ensure legal compliance. MHA Training was established in 2008 based at our training centre in Warrington, Cheshire. We provide an array of services On-Site also for clients around the North West in areas such as Manchester, Liverpool, Widnes, St. Helens, Runcorn, Wigan, Preston and Leeds. Over the years we have expanded and have instructors available Nationwide.